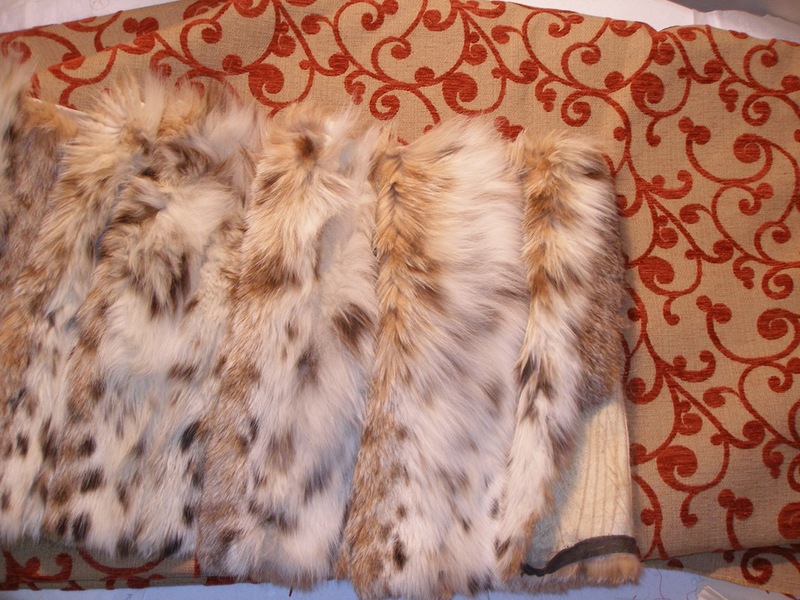 On my trip downtown on Monday, I had the time to hunt for spotted lynx so I can make up my Cavalli coat. One problem. Spotted lynx in a faux fur complete with the long guard hairs is not available on Queen Street anywhere. I want the long fur, not the short. Plenty to be had in short faux fur, but I want the long. I did find some interesting sculpted tiger faux fur. It’s in my mental stash for future reference! Anyways, back to the fur. Dear reader, you know I’ve been watching eBay, but the price on a full coat that I’m going to cut up is way more than I wanted to spend. I was hoping to pick up something for around $100 at the top end. Dreamer…..
And no real spotted cat fur to be had at a furriers anywhere in the fashion district. One furrier had two printed red fox collars and a headband that would have been perfect, but he wanted $300 for both collars. Uh….. I don’t think so. So I went to our trusted friend. My DH had suggested going to the furrier we’ve done all our… well…. ahem…. my… fur business with to see if he had something. And boy, am I glad I did. I probably didn’t get the best deal on the fur…..
“Well, tell me exactly what you want to do with this coat,” he asked me. So I gave him the whole spiel about the Cavalli coat and that I needed the trim for the collar and cuffs (even though he’d told me last year that fur on cuffs is a liability because it wears too badly) and possibly the facing of the coat if I had extra; that I’d been looking on eBay, but hadn’t found what I wanted, so I was asking him for help. He brought out the trimmings from a coat he’d shortened, which is in the picture above, and a very well-worn used coat which he said I didn’t want. So I got the trimmings of the coat. And one hour’s crash lesson in spotted cat fur, which is worth more to me than the price of the materials. It was just a smidgen more than I wanted to pay, but well worth my time and money. He helped me plan out where to cut the fur to maximize the spots on the collar and cuffs. He showed me how to cut the fur carefully and how to stitch it on my little home sewing machine. And gave me two blades. My DH, when he saw them tonight, was impressed with them. “You be really careful with these. They’re very sharp.” ??? You don’t say! BTW, I told my furrier that I’d love to learn how to “do” fur. It’s on the list of things I’d like to try before I die. And the information…..wow! Did you know that the wider the pelt, the whiter the spotted area and the spottier the pelt the more money? Or that there’s more spots at the bottom of the pelt that the top? And that the spots only exist on the belly? And the trimmings I got were the bottom of the coat, which means I got the spottiest part of the coat! 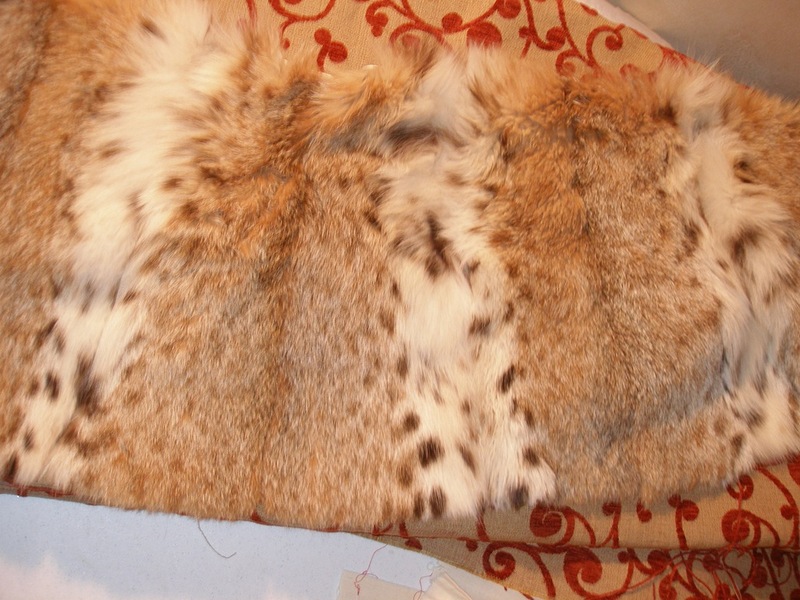 And if I’m able to follow his advice on cutting, I’ll have the non-spotted fur to play around with on another garment. I have to say, I love fur. I’m a northern Alberta girl, y’know. Fur is the only thing that keeps you really warm in winter. I was reminded of this on Monday walking around the Fashion District in –2o0 winds. I have fox trim on my coat collar and hood, and when I put my hood up around my face the long guard hairs on the fur kept the wind from reaching my face. Amazing. My DH looked at me like I was out to lunch when I told him this. “Well, dear, the animals do stay warm outside, so the fur’s gotta be doing a good job. They don’t die from the cold!” Spoken like the truly practical wise man that he is. What a great tonne of learning you got! You’re blessed to have someone who’s so hugely knowledgable on furs & how best to handle them. I’m of course looking forward to seeing your finished garment, & after telling us how much you learned, I’m sure I am not alone in hoping that you give some really detailed insights on how you constructed the coat, & especially how the fur was cut and attached. Looking out for a truly one-of-a-kind coat in the near future! I love fur coats and they are the only really warm thing in the winter. BTW I have a short blonde mink jacket circa 1950 that I am looking for a home for. the lining is in good condition and the only thing I want out of it is the embroidered initials. Let me know by email if you are interested. Kathryn Brenne teaches a workshop in sewing with fur. She’s in North Bay, is a patient and good instructor, and has a fantastic studio to work in. She wrote an article on the subject in the most recent Vogue Pattern Magazine which is very comprehensive. Wow! That is beautiful stuff. Your coat will be amazing. I hope you are able to post a few “in process” blog entries on how you work with the fur. It’s not something I can imagine doing, but still fascinating.